If your Virtual Contact Center defines numerous roles and administrators, you may find it hard to track them in a scrollable list. Role Based Management allows you to search and filter roles and administrators lists by specific criteria such as Role ID, Role Name, and Administrators. Navigate to Security > Roles tab. You can sort the Roles list in the desired order by applying sort parameters. 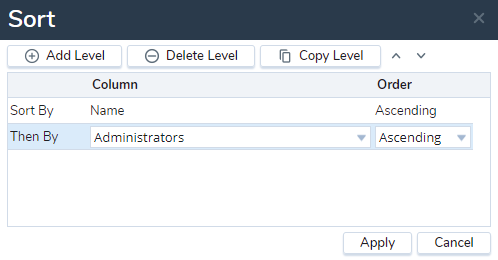 You can sort by Role Name, Role ID, and number of Administrators assigned to a role by applying suitable parameters. You can sort the list in the ascending or descending order with just a single click on the header bar. You have the option to sort by multiple fields using Configure Sort option. To sort by a single field, click on the header bar for that field to sort in the ascending/descending order automatically.